Some films about race in the US are angry, many are passionate, or terrifying or heartbreaking, and a few are funny. If Beale Street Could Talk, opening in US theaters in major cities on Friday, is marked by a quiet beauty and dignity, despite the despair that runs through it. Based on the 1974 novel with the same title by the late James Baldwin, the film is director Barry Jenkins' follow-up to his 2016 Oscar-winner Moonlight. It is the latest in a slew of movies by or about African-Americans that were nominated last week for Golden Globe Awards, including Spike Lee's Ku Klux Klan thriller BlacKkKlansman, superhero movie Black Panther, and 1960s road trip Green Book. If Beale Street Could Talk is the story of two hopeful young lovers in Harlem whose future is ruined when the man is imprisoned for a crime he did not commit. Baldwin said Beale Street could stand for any black community in the US. Jenkins said he was drawn to make the film because of its blend of "sensuality and love - both physical and emotional love - but also this other voice that was very, very clear about social critique and taking America to task for the role it has played in the lives and the degradation of black folks." Yet Jenkins, who also adapted the screenplay, says rage is not in his wheelhouse as a filmmaker. "I feel like anger has never been the best place for me to work from," he said. In contrast to the more strident tone of the novel, the film is made from the perspective of young and pregnant Tish, played by newcomer KiKi Layne, and her loving family. "Tish is so young and pure and wide-eyed and so innocent, that to work from any other place than that would have felt like a false move," Jenkins said. 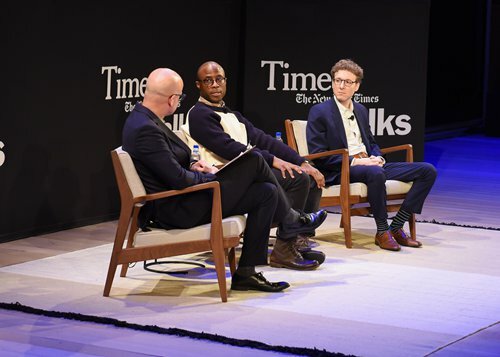 Jenkins sees Beale Street and Moonlight as companion pieces, partly because he wrote both films during the summer of 2013. They are also about black families, albeit very different. Moonlight depicted a young black gay man growing up in a hard-scrabble neighborhood of contemporary Miami. "I still get notes and letters from total strangers who feel their lives have been impacted or in some ways improved because of the visibility that Moonlight brought to their personal lives," he said. Jenkins hopes Beale Street leaves audiences with "a sense of optimism that the lives and souls of black folks in America have often been rooted in despair and degradation, and yet there has always been love, joy, family and community."